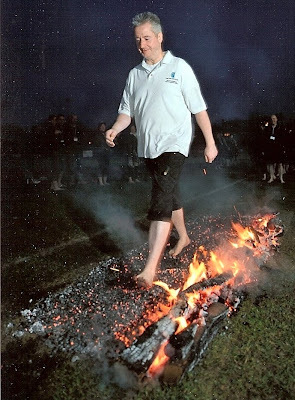 Above: The moment I completed my first of two firewalks on Sunday February 20, 2011 for The Stroke Association. 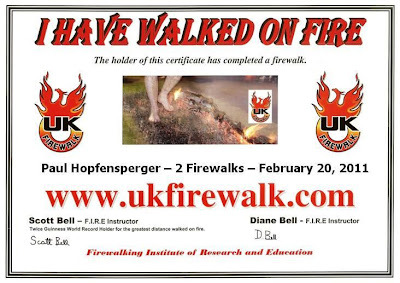 Yesterday I completed another of my long term goals by completing not one, but two firewalks. I handed just over £293 (inc. gift aid) to The Stroke Association yesterday, but hopefully I can add to this over the next week or so. Arriving at The Haberden, home of The Bury St Edmunds Rugby Club, at about 3:45, I queued up with about 80 other potential firwalkers to hand over our sponsorship money, and sign our disclaimer. As I walked in, the fire was built and lit ready for us to commence at about 5:15pm. Above: The team from UK Firewalk build and light the fire ready for about 80 firewalkers to do battle with both body and mind. After a very interesting and informative training session with two time Guinness World Record Holder for the greatest distance walked on fire - Scott Bell, we all walked out onto the Bury St Edmunds 1st XV Rugby pitch to the cheer of the quite large crowd, took our shoes off and queued to await our turns. The ground was absolutely freezing. I think taking our shoes off was designed to make our feet numb to the pain of the fire. It really did make them numb. Above: The fire is well alight, the crowd was cheering and it was time to commence the firewalk! Scott Bell started us off by showing how it was done; stand at the start of the fire, mental focus - picturing yourself completing the firewalk before you have even started it (much as I did many times on my channel swims), a big breath - in through the nose and out through the mouth, then...just walk across totally focussed on the job in hand (or should I say under foot?!). It looked easy, he walked across and everyone followed, one by one to large cheers of the crowd for every successful firewalk. Eventually it was my turn, and I went through the mental routine as described above, and as I had in fact been doing many times in my head in the days leading up to the firewalk using NLP visualisation techniques. It went very quickly. Scott had measured the temperature at 533 Degrees Centigrade. That's HOT where I come from! But having mentally prepared for it, apart from a small bit of charcoal catching in between my left foot toes, I didn't feel a thing. The body can cope with whatever you throw at it, as long as your mind is in the right place. I enjoyed it so much, I went back and did it again! My feet were as black as black can be afterwards. Even today after washing them last night, and bathing them this morning, they are still quite black. But no pain, blisters or after affects. 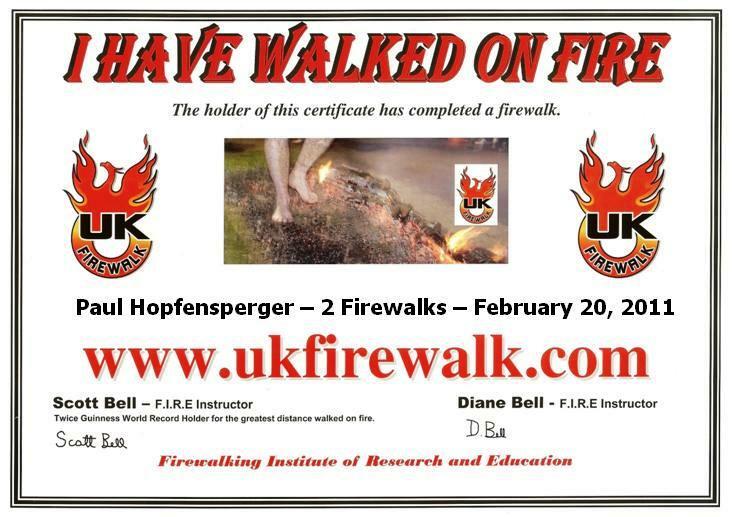 Just pleasure at having completed the firewalk and having exceeded my £250 target for The Stroke Association. Thank you to my family and friends who turned up to watch (Beccy, Luca, Nico, Mum, Dad, Terry, Viv, Mike, Monica, Julie & Dave) and for those who sponsored me. But it's not too late to sponsor me. Just click on the link below and donate securely online on my JustGiving web page.